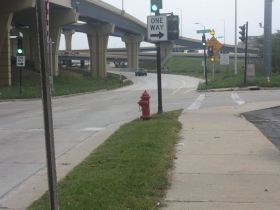 The east end of Clybourn Street is scheduled for an upgrade. Photo by Carl Baehr. 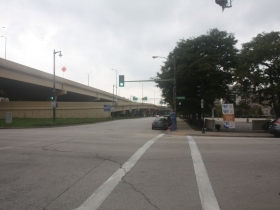 The proposed Lakefront Gateway project calls for a small portion of Clybourn Street to be lengthened and widened. It will be extended to Discovery World and will include a wide landscaped median from there to Van Buren Street. 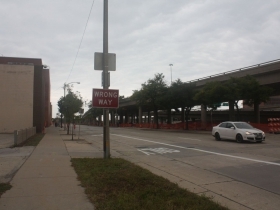 But whatever improvements are made to the street, it will never return to its former glory as Milwaukee’s busiest thoroughfare, a distinction it held for a decade and a half. When white settlers arrived in the city in the mid-1830s, the Milwaukee River did not flow into Lake Michigan via the channel that is now under the Hoan Bridge. Instead it entered the lake farther south, near what is now Bay View. The river was too shallow to allow larger boats passage to the city docks. Consequently, the bigger vessels stayed in the harbor and passengers and freight were off-loaded to smaller boats which then made the trip up the river. Piers extending far out into the lake would solve the problem as people and cargo could be unloaded onto the piers directly from the larger ships. 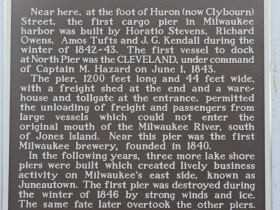 The only reasonable place to put the piers was at the foot of Clybourn Street, which was then known as Huron Street. South of Huron Street was marsh all the way to Bay View, and to the north were tall, steep bluffs. Huron Street itself was largely swampy, so it was filled in to provide a route to N. Water Street and then to downtown. By 1843 the first pier, 44-feet wide and extending nearly a quarter mile into the lake, was built. The street bustled with the traffic streaming from it and subsequent piers. Wagons, carts and other conveyances carried passengers and freight from the docks to the city center. Sidewalk traffic was heavy. Hotels, restaurants, and taverns lined the street. The hotels appealed to specific immigrant groups, whether coming to live in Milwaukee or passing through to the west. The Yankees would stay at lodgings like the Eastern Hotel or the Cottage Inn. The Germans were attracted to Rheinischer Hof and the Irish to the Shamrock or Kilkenny Hotels. All the traffic and the unpredictability of horses, the main source of transportation, was a recipe for trouble. For example, one woman was seriously hurt when a runaway horse ran her over on the street. A man was injured when the horses pulling his wagon spooked, knocking him off the wagon. It wasn’t always the horses’ fault. Two German men were each fined five dollars for racing their horses down the road, almost hitting a woman and her child. Huron Street was named after Lake Huron by Solomon Juneau and Morgan L. Martin in 1835. 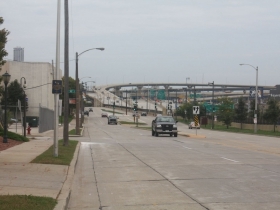 But as with many Milwaukee streets, its name changed west of the river: in Kilbourntown it was named (also in 1835) for Archibald Clybourn, a Chicago investor. In 1829, Clybourn, apparently not concerned with the aroma, built a 20-room mansion next to Chicago’s first stockyard. However, it was his stockyard; he is credited with beginning a tradition that would make Chicago the “hog butcher of the world.” He owned a warehouse business in Milwaukee during its early days but remained a resident of Chicago. By 1858, the passengers and cargo were gone from Huron/Clybourn street and so were many of the businesses. The street became a ghost of its former self. The federal government, after 20 years of badgering by local authorities, had dug a channel from the river to the lake. Known as the “Straight Cut,” it passes just south of the Marcus Amphitheater. The short canal enabled large vessels to enter the inner harbor and dock at businesses along the river. The canal also made the piers redundant and they were eventually removed. For much of the nineteenth century, Huron/Clybourn Street ran through two Irish neighborhoods, the Third Ward and, a few blocks to the west, Tory Hill. After the Third Ward Fire of 1892, many displaced Irish families moved farther west on the street to Merrill Park, which quickly became an Irish neighborhood. In 1926, during Milwaukee’s street renaming program, Huron Street was renamed Clybourn Street, assuring that it would have only one name for its entire length. 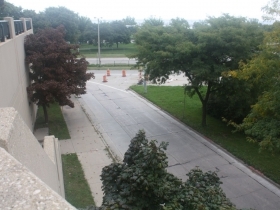 Today, Clybourn Street downtown is literally in the shadow of the raised freeway that it parallels, and is primarily an access road for on and off ramps. It becomes a ramp itself at N. 7th Street. The street resumes at N. 13th Street and rises above the freeway and finally diverges from it after N. 25th Street as the freeway moves south away from the street. It becomes more residential as it moves west until it is interrupted by Merrill Park at N. 35th Street. 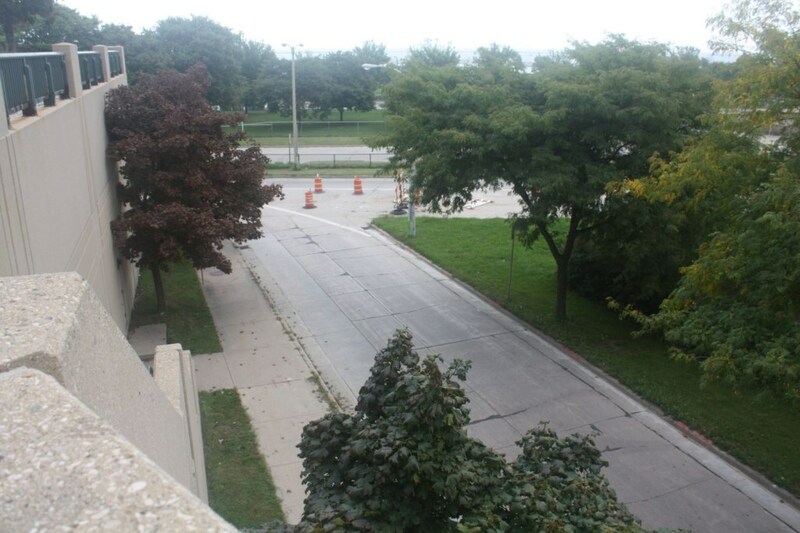 The street picks up again in Piggsville from N. 38th Street to N. 42nd Street where it ends at the Menomonee River. What’s the history of Main Street in West Allis? Surprisingly, the Main Street you refer to is not in West Allis, it is in Milwaukee. (See Milwaukee map at https://www.maptechnica.com/us-city-boundary-map/city/Milwaukee/state/WI/cityid/5553000). This may have been the main street in the Euclid Park Subdivision, platted in 1888. The developer, F.T. Adler, would have had to have been wildly optimistic to hope that it would grow to be a traditional Main Street. Milwaukee’s original Main Street was changed to Broadway in 1870. Carl, do you have a way for people to keep up with your work, articles, updates etc? Like a twitter page or newsletter? Thank you for your interest but at this time I do not have any means of communicating my activities. Should I come up with a method, I will post it here. Thanks again. Where WE Energies is now located between Everett and Clybourn on the north and south with N.2nd to the east and N.4th on the west was a Milwaukee Road train station. The tracks were on the south side of the station. Where were they in relation to Clybourn? Glenn, The tracks were north of Clybourn as shown by the 1892 map of Milwaukee in the American Geographical Society’s collection http://collections.lib.uwm.edu/cdm/singleitem/collection/agdm/id/22/rec/39.